The days when clinicians were paid simply by the volume of services rendered to Medicare patients has passed. The transition period where providers are starting to get paid or rewarded based on the value they provide has begun, with the dual goals of better patient outcomes and lower costs. This new era of value-based payment was ushered in by MACRA or the Medicare Access and CHIP Reauthorization Act of 2015, a comprehensive and complex law was passed in Congress with bipartisan support. Under MACRA, physicians who provide services and treatment to Medicare patients will be rewarded higher payment based on the quality of the care provided instead of the volume of services. 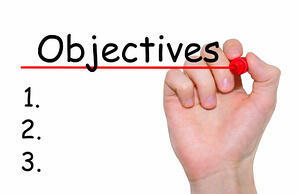 This is often referred to as "pay-for-performance" model, as opposed to the previous "pay-for-service" model. What is Quality Payment Program (QPP)? 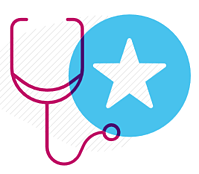 MACRA created the Quality Payment Program or QPP, an incentive program which permanently ended the complex, algorithm-based Medicare Sustainable Growth Rate (SGR) formula, which was considered by experts and practitioners as a flawed system. If it had been implemented as intended, the SGR would have resulted in significant cuts in physician reimbursement. To avoid these, Congress had to pass a new law every year since 2003 to offset the decreases by authorizing the current fee schedule and a small increase for inflation. On the other hand, the QPP is designed to have the ability to reward high quality Medicare clinicians with reimbursement increases and at the same time reduce payments to clinicians who don’t meet the performance standards. Who can Participate in QPP? The majority of clinicians who provide services for Medicare patients will participate in MACRA through MIPS. 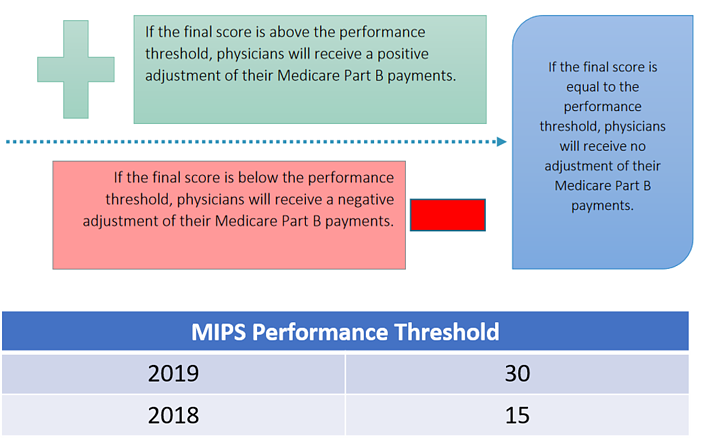 MIPS provides more individualized performance-based payment adjustments depending on the quality of care and services that eligible professionals (EPs) provide to patients. 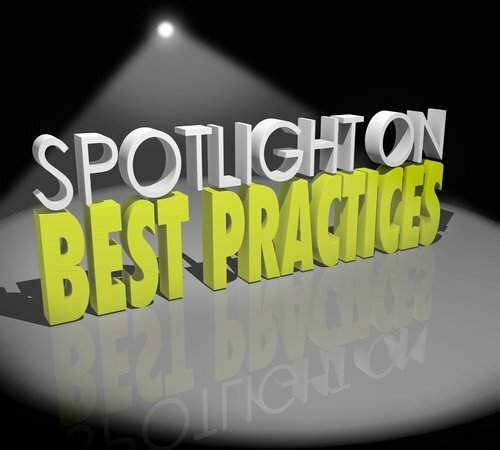 Performance is evaluated by CMS based on a combination of provider-reported data and claims information. Due to policy changes, requirements may change each Performance Year (PY). MIPS consolidates three fee-for-service programs – the Physician Quality Reporting System (PQRS), the Value-Based Payment Modifier Program (VBM) and the Medicare Electronic Health Records (HER) Incentive Program (aka "Meaningful Use") – into one fee-for-value program. Who is Eligible to Participate in MIPS? Under MIPS, clinicians are included if they are an eligible type and exceed the low-volume threshold. Clinicians who want to know if they are required to participate in MIPS can check the QPP Participation Status Tool, by entering their 10-digit NPI number in the search field. 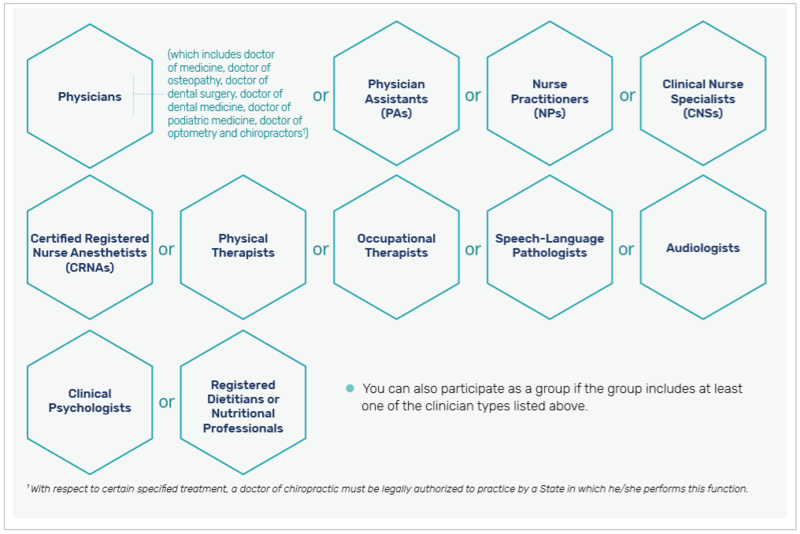 Who is Exempt from Participating in MIPS? They have not enrolled or participated in Medicare prior to the current year. They do not exceed the low-volume threshold. This means that they bill $90,000 or less in Medicare Part B or provide services for 200 or fewer Medicare Part B patients, or provide 200 or fewer covered professional services to those patients. They participate in an Advance Alternative Payment Model (APMs) as a Qualifying Participant (QP). 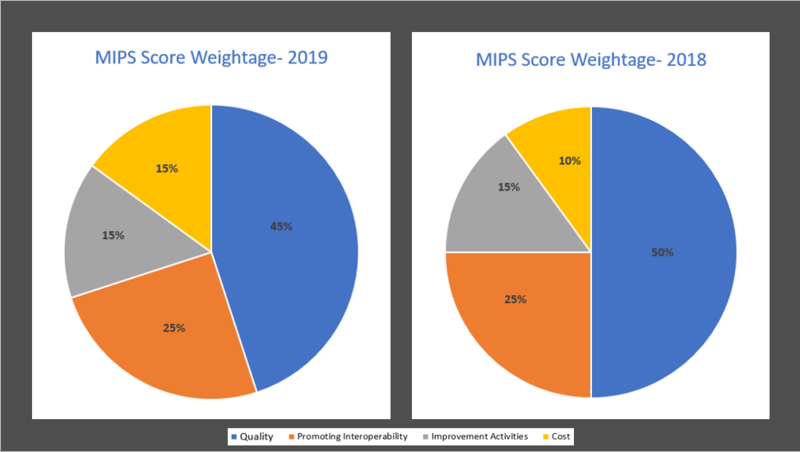 Performance in MIPS is measured through the data clinicians report in four areas - Quality, Improvement Activities, Promoting Interoperability (formerly Advancing Care Information), and Cost. Each of these four performance categories has a weighted score, which will then be aggregated into a MIPS composite performance score. Based on the composite score of up to 100 points, a payment adjustment will be determined and applied two calendar years later. Because “budget neutrality” is part of the MACRA requirements, it is anticipated that an equal number of providers will receive upward adjustments and downward adjustments. For PY 2019, evaluation is based on activity data reported for the Quality, Improvement Activities, and Promoting Interoperability categories. Cost measures are calculated by CMS based on claims submitted, so clinicians are not required to report any information separately for this category. According to CMS, this performance category replaces PQRS, and covers the quality of the care delivered. 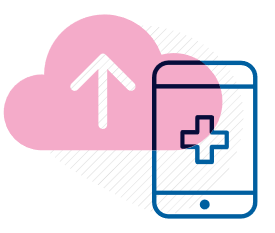 It measures health care processes, outcomes, and patient experiences of their care. In 2018, CMS renamed the Advancing Care Information performance category to Promoting Interoperability (PI) to focus on patient engagement and the electronic exchange of health information using certified electronic health record technology (CEHRT). This is done by proactively sharing information with other clinicians or the patient in a comprehensive manner. This may include: sharing test results, visit summaries, and therapeutic plans with the patient and other facilities to coordinate care. 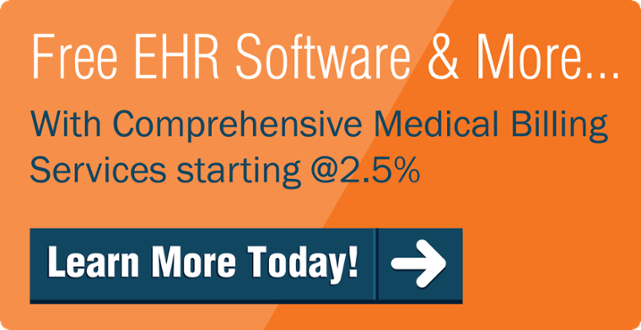 This performance category replaced the Medicare EHR Incentive Program, commonly known as Meaningful Use. 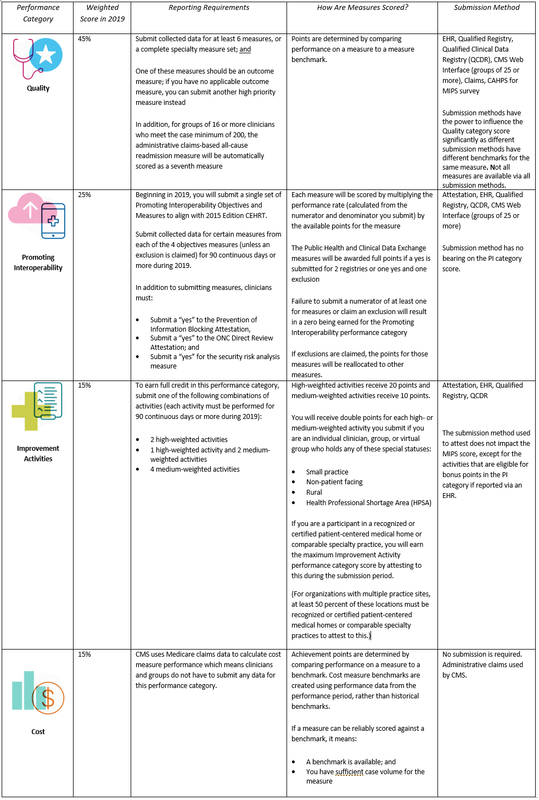 This is a new performance category that includes an inventory of activities that assess how clinicians improve their care processes, enhance patient engagement in care, and increase access to care. 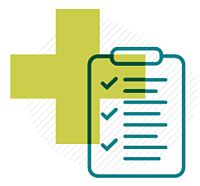 The inventory allows clinicians to choose the activities appropriate to their practice from categories such as enhancing care coordination, patient and clinician shared decision-making, and expansion of practice access. This is the fourth performance category. This performance category replaces the VBM. Cost measures are calculated by CMS based on claims submitted, so clinicians are not required to report any information separately. When and How Much will Practices be Paid? Alternative Payment Model (APM) is the other MACRA reimbursement pathway. It is a payment approach or model that incentivizes clinicians to provide higher-quality care by having them meet certain quality and cost metrics. Clinicians can qualify to be reimbursed under the APM pathway by participating in initiatives such as the Medicare Shared Savings Program Accountable Care Organization (MSSP ACO) program. APM “entities” participate by entering into an agreement with CMS, which can involve complex rules governing requirement and reimbursement. 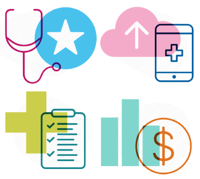 An Advanced APM is a track of the Quality Payment Program that offers a 5 percent incentive for achieving threshold levels of payments or patients through Advanced APMs. If you achieve these thresholds, you are excluded from the MIPS reporting requirements and payment adjustment. Most Advanced APMs are also MIPS APMs. 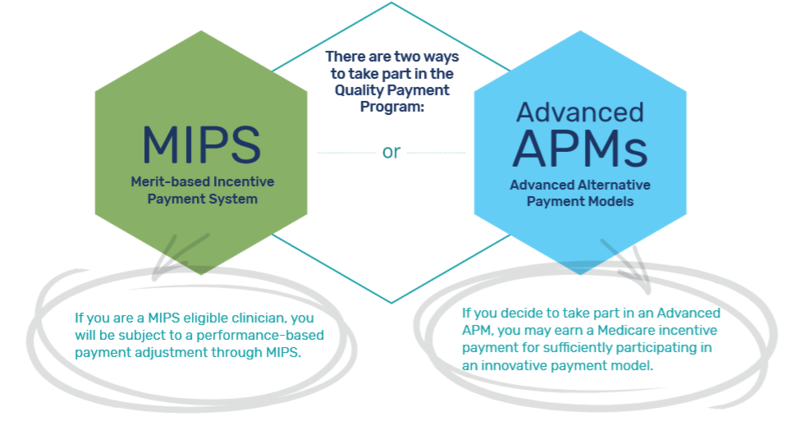 MIPS Eligible clinicians participating in Advanced APMs are included in MIPS if they do not meet the threshold for payments or patients sufficient to become a Qualifying APM Participant (QP). 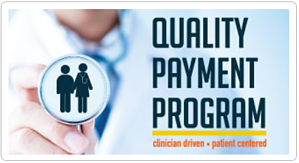 Starting in Performance Year 2019, eligible clinicians will be able to become Qualifying Alternative Payment Model Participant (QPs) through the All-Payer Option. To be able to use this option, eligible clinicians must participate in a combination of Advanced APMs with Medicare and Other-Payer Advanced APMs. Other-Payer Advanced APMs are non-Medicare payment arrangements that meet criteria that are similar to Advanced APMs under Medicare. Future Medicare payments will be dependent on participation and performance in these programs. 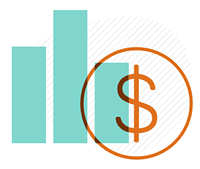 Because CMS will base its payment adjustments for both MIPS and APMs on performance from two calendar years prior, practices need to take this into consideration for their revenue cycle strategies and income outlook. To streamline reporting and accessing of data, practices may need to invest in technology tools such as certified EHRs that offer interoperability/sharing of data across systems. Physicians will need education and training for themselves and their staff, to understand the details of the new law and how it affects them. While this can this be the first and main obstacle to participating, investing the time and resources to make sure this is in place can have significant pay-offs down the road. Smaller practices who want to participate in virtual groups or APMs will need to collaborate and improve partnerships locally and regionally. Clinicians will need to wrap their heads around how the performance categories are scored, how measures are reported, as well as what the reporting timelines are. Detailed information and tools regarding these topics are available at https://qpp.cms.gov/. According to a recent article in Health Affairs, adjustment ranges for Medicare payments under MIPS can actually be larger than the publicized amounts. Health Affairs notes that "For example, in 2017, adjustments could have ranged from -4% up to +22% (comprised of the generally publicized amount of 4%, scaled by a factor of 3 and inclusive of a 10% exceptional performer bonus)." It is important to keep in mind that while positive adjustments are always welcome, negative adjustments are also a reality and can have a significant impact on the practice's revenue and bottom line. Finding and using the large amount of free informational tools provided by CMS online, as well as other FAQs and tip sheets by other authoritative organizations. Some links are provided at the end of this article, for reference. Contacting on-the-ground resource organizations established by CMS. Evaluating whether using a third-party intermediary to collect and submit data on your behalf may be helpful. Discussing their goals and requirements with their EHR and Health IT- related vendors. Assessing whether joining an APM is beneficial and viable. MACRA and the QPP represent a sweeping revamp of Medicare payments to emphasize value-based care, and it affects providers and practices at every level. Its impacts extend from how care is provided, to how it is reported, evaluated, and rewarded. It affects clinical practice, patient outcomes, and practices' financial growth. While not perfect, it has been evolving, due in part to the feedback from the healthcare community. Physicians and practices who pay attention, adapt, and provide feedback that may help influence future iterations of this program are helping both their patients and themselves to grow and thrive in this new reality.